Hello! 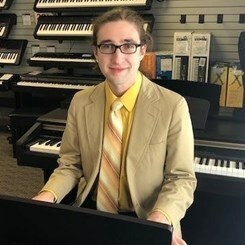 I'm John Loughton, and I have been a senior sales associate with Music & Arts since December 2018! I hold a Bachelor of Arts in Music from the College of William and Mary, where I focused on composition, music production, and ethnomusicology. While my primary instrument is keyboard, I also play guitar, bass, and oud (Arab lute), along with basic experience with banjo, accordion, and hand percussion. In college, I performed with the Middle Eastern Music Ensemble, with a wide repertoire from the classical Arab, Greek, Turkish, and Sephardic Jewish traditions. I also regularly perform my original acoustic and classical instrumental works. After and during college I taught keyboard, guitar, and bass for middle and high school students at after-school programs. I also taught sectionals for oud, cello, and traditional percussion while in college. I have extensive experience with composing, recording, and producing original music, most notably as my solo project Veii. My other composing projects include scoring independent films, incidental music for original theater, and works for chamber ensembles and orchestra. My composing interests include indeterminism, improvisation, minimalism, and soundscapes. Since high school I have also loved progressive rock, glam rock, folk, and jazz, and have performed with original and cover bands from New Jersey through Virginia. Outside of music, I also love marine biology (especially cephalopods), gardening, vegetarian cooking, and Star Wars. I'm always interested in hearing about everyone's original projects, and I'd be excited to talk with you about them and help you find everything you need!